Note: Wooden bottom outside iron hull. Built at Glasgow, Scotland; shipped over in pieces, assembled Montreal. 1870, Oct 22 Launched Montreal, QUE. ; Owned Canadian Navigation Co.
1875 Owned Richelieu and Ontario Navigation Co.; 490 gross tons. 1878 remeasured; 1203 gross / 714 net tons. 1897 remeasured 179 x 27 x 11. 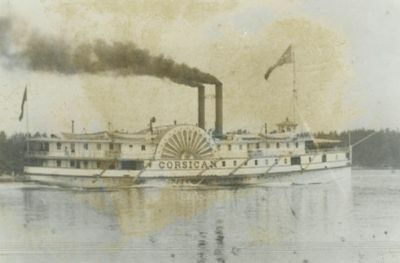 1907, Sep 21 Burned at her dock, Toronto, ONT; loss of 1 life; later recovered and sold American as a barge (US167791?). 1908 Converted to bulk freight barge at Polson Iron Works, Toronto, ONT; 190 x 27 x 11'2". 1934 Out of registry exempt.